ECR Minerals (LON:ECR) re-affirmed its commitment to expanding its assets in West Australian in its latest results released last week, despite widening losses. The precious metals exploration company is looking to its Central Victorian Goldfields and the Yilgarn Craton projects in Western Australia as key to its business strategy moving ahead. Back in January, the AIM-listed firm said it had applied for new applications in the Yilgarn region, which is named the Windidda gold project. The area covers a total of 523 graticular blocks, which amounts to roughly 1,600 km2 of the Yilgarn Craton. The area was highlighted as potentially hosting potential greenstone-hosted gold trends. Last month, ECR Minerals reported significant high-grade gold assays from the reverse circulation (RC) drilling programme recently completed at the Blue Moon prospect in Australia. Shares shot up as much as 6% on the day of the announcement, as investors welcomed the promising results. Most recently, the company reported its final results last week, with losses widening slightly for the year. Specifically, ECR Minerals reported a £550,018 loss for the year to September end, slightly higher than the £511,124 loss reported a year before. ECR Minerals plc is pleased to announce its audited financial statements for the year ended 30 September 2018. The information presented below has been extracted from the Company’s Annual Report and Accounts 2018. Copies of the Annual Report and Accounts 2018 together with a notice of annual general meeting will be posted to shareholders today and will be available shortly on the Company’s website www.ecrminerals.comand from the Company’s registered office at Unit 117, Chester House, 81-83 Fulham High Street, Fulham Green, London SW6 3JA. The text of the notice of annual general meeting is provided below. Over the past year, ECR has continued to advance and augment its portfolio of gold exploration projects in Australia, which is one of the world’s principal gold producers and one of the foremost destinations for global mining investment. During the financial year ended 30 September 2018 and since the year-end the Company’s wholly owned Australian subsidiary Mercator Gold Australia Pty Ltd (“MGA”) has carried out extensive exploration work in the state of Victoria, with drilling completed at two prospects in the Avoca gold project area during calendar year 2018, followed by drilling at the Creswick gold project in February 2019, and at the Blue Moon and Black Cat prospects in the Bailieston gold project area later the same month. The results of these programmes are discussed in the Chief Executive Officer’s report, to the extent which they are available. I am pleased to note that drilling results announced to date have included some significant intercepts at Blue Moon, the most exciting being 2 metres at 17.87 g/t gold from 57 metres downhole in BBM007, within a zone of 15 metres at 3.81 g/t gold from 51 metres. In late 2018, the Group moved into another world-class Australian gold province, the Yilgarn Craton in Western Australia. 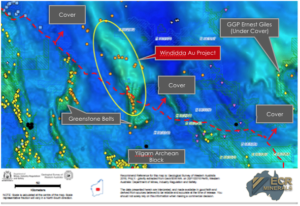 MGA has made nine exploration licence applications over a 1,600 square kilometre land package which has been identified as a potential greenstone-hosted orogenic gold exploration opportunity with significant potential to contain Archaean greenstones buried beneath Permian cover sequences of the Canning Basin. Importantly, ECR is moving forward from a position of financial strength, having raised £1.35 million (before costs) during calendar year 2018, and with the potential for more than £2 million of further funding to come into the Company through the exercise of warrants issued to investors as part of those fundraisings. I would like to welcome Sam Garrett to the Board as a non- executive director. Mr Garrett, who is a resident of Australia, holds a Bachelor of Science degree with First Class Honours in Geology and a Master of Economic Geology degree, both from the University of Tasmania. He also holds a Master of Applied Finance degree from Macquarie University in Australia. Mr Garrett has over 30 years of exploration management, project assessment and operational experience working for large multi-national and junior mining and exploration companies in ten countries including Australia, Argentina and the Philippines. I am sure that Sam has a valuable contribution to make as a director of ECR. Christian Dennis resigned as a non-executive director of the Company in July 2018, to focus on his other business interests. The Board would like to thank Christian for his service as a director of ECR and wish him well for the future. 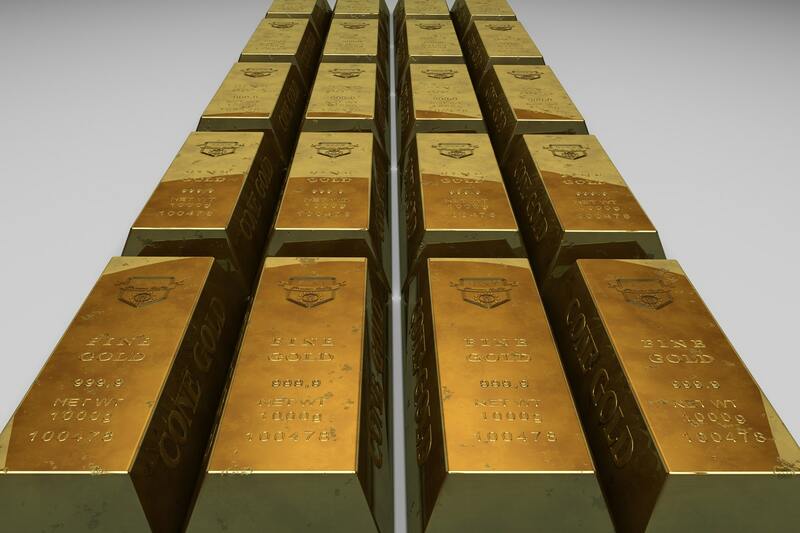 Pleasingly, the gold price has made a healthy start to 2019 by returning to levels in excess of USD 1,300 per troy ounce, and we are hopeful that macroeconomic conditions will see the price rise further in the near future. Regardless, the Board remains confident in ECR’s strategic objective of discovering a multi-million ounce gold deposit, and we look forward to reporting further progress towards this goal. The Group’s concentration on gold exploration in the state of Victoria, Australia, continued apace during the year, as did the exploration boom across the Victorian gold province as a whole. 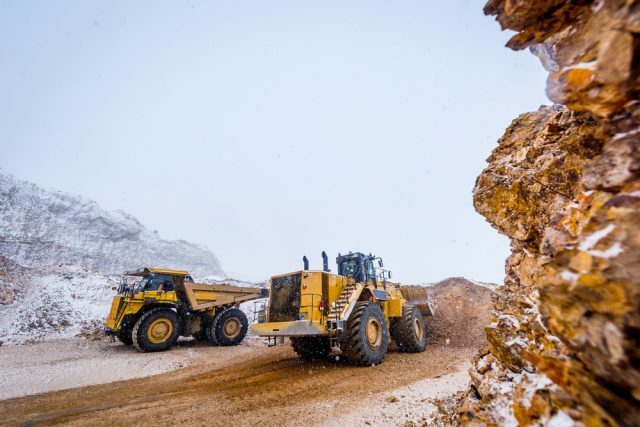 The latter has been driven in large part by the success story which has unfolded at the Fosterville gold mine, which produced more than 350,000 ounces of gold in 2018 and is firmly established as Victoria’s largest gold producer. At the same time, we have expanded our footprint to Western Australia by applying for a package of nine exploration licences in the Yilgarn Craton, which comprise the Windidda gold project, and maintained our presence in Argentina at the SLM gold project in La Rioja Province. 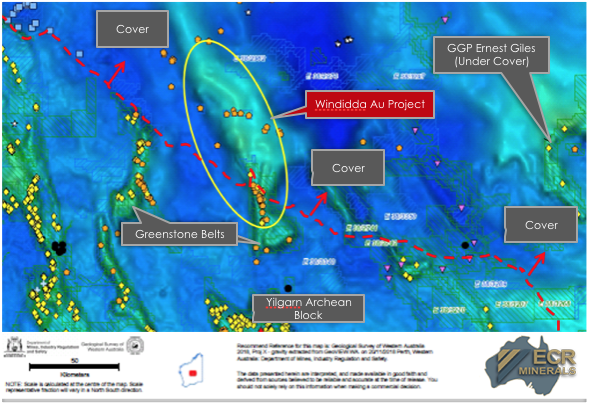 We are also continuously evaluating potential new opportunities and will engage with those, such as the Windidda project, that we determine may have the potential to enable the achievement of ECR’s primary strategic objective, which is to generate value for shareholders through the discovery of a multi-million ounce gold deposit. By convention, much of this Chief Executive Officer’s Report relates to activities which have taken place after 30 September 2018. Diamond drilling at the Bung Bong, Monte Christo and Blue Moon prospects was completed prior to the year-end, as was rock-chip sampling in the Byron and Cherry Tree areas. Reverse circulation (RC) drilling at Blue Moon and the Creswick project and rotary air blast (RAB) drilling at the Black Cat prospect has taken place in the current financial year. In Victoria, ECR’s wholly owned Australian subsidiary Mercator Gold Australia Pty Ltd (“MGA”) has 100% ownership of six exploration licences: Avoca (EL5387), Bailieston (EL5433), Creswick (EL006184), Moormbool (EL006280 and EL006913) and Timor (EL006278). 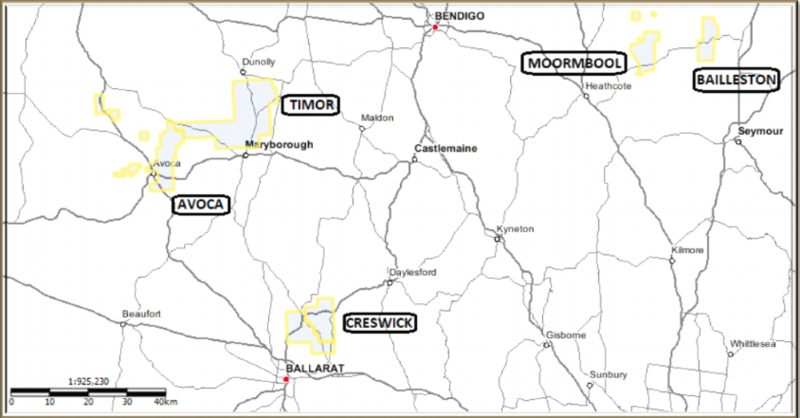 MGA has pending applications for four further exploration licences, two south and south west of the existing licence at Creswick; and two others in the vicinity of the Bailieston and Moormbool project areas, to secure available ground south and south east of a licence applied for by Newmont Exploration Pty Ltd. 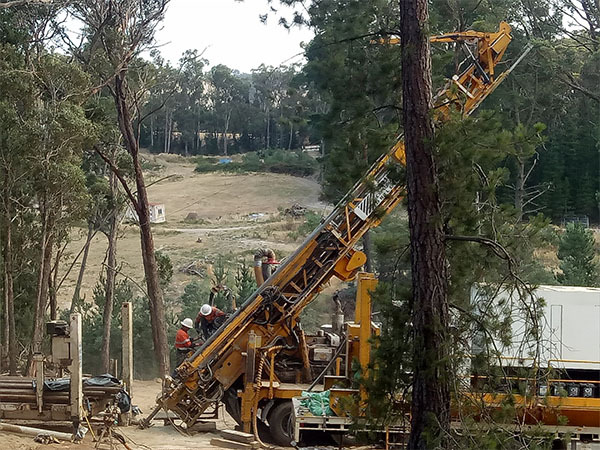 In early February 2019, MGA commenced a reverse circulation (RC) drilling programme at Creswick, which was followed by a second RC programme at the Blue Moon prospect in the Bailieston gold project area. In parallel, a rotary air blast (RAB) programme was carried out at the Black Cat prospect, which is also within the Bailieston gold project area. The Company announced assay results in respect of three holes drilled at Blue Moon on 14 March 2019, with results from a further nine holes expected to be announced soon. Assay results from drilling at Black Cat and Creswick are also expected to be announced in the near future. From the announced Blue Moon results, significant intersections included 2 metres at 17.87 g/t gold from 57 metres down hole in BBM007, within a zone of 15 metres at 3.81 g/t gold from 51 metres. The Bailieston project is at the epicentre of the current gold exploration boom in Victoria, being located close to the highly successful Fosterville mine owned by Kirkland Lake Gold. This point is underlined by the arrival of Newmont Exploration in the district with an application for ground immediately to the north of the Black Cat prospect. The focus of activities in the Bailieston project area for the past year has been the Blue Moon prospect. This was identified as a high priority prospect in early 2018 when Dr Rodney Boucher, an experienced Victorian gold geologist, commenced a review of all available data on MGA’s exploration licences (at that time numbering four licences), complemented by geological mapping and geochemical surveys in selected areas. The purpose of this work was to help define targets for a diamond drilling programme extending across a number of MGA’s prospects. The geochemical surveys utilised a portable XRF to delineate proxy minerals associated with gold. An arsenic- anomalous zone up to 40 metres wide and more than 200 metres long was identified at Blue Moon, and previous work showed anomalism over a further 150 metres to the west. Previous rock chip samples included results of 12.1, 10.1 and 7.0 g/t gold, and previous soil surveys identified gold to 5.0 g/t. The diamond drilling at Blue Moon was intended to test the arsenic and antimony anomalies identified by the soil geochemical survey completed by MGA in early 2018. Positive results from the drilling were announced in July 2018. Diamond drill holes BBM001 and BBM002 were designed to establish the dip of the host sandstones and assess the potential for gold mineralisation. Intercepts of 5.45 metres at 0.12 g/t gold from 33.95 metres and 10.0 metres at 0.16 g/t Au from 43.8 metres were obtained in BBM001 and BBM002, respectively. Upon drilling faulted, stockworked sandstone in the first two holes, BBM003 was drilled down dip to test the nature of the cross-cutting faults and veins and to obtain a large number of samples for analysis. An intercept of 39.5 metres at 0.3 g/t gold from 24.2 metres, including 2.7 metres at 1.12 g/t gold from 60 metres, was obtained in BBM003. Intersections given in this paragraph are apparent width. The gold mineralisation intersected is hosted in an approximately 5.5 metre wide medium-grained sandstone within a thick bioturbated shale. Diorite sills have intruded along the margins of the sandstone. The sandstone is metamorphosed to quartzite and the brittle host showed stockwork vein development in each of the three holes. Small iron-oxide pseudomorphs thought to be of arsenopyrite and pyrite were disseminated throughout the quartzite. Deep weathering of the sandstone meant that no samples of fresh rock could be obtained from the diamond drill holes to verify the minerals. The high repeatability of the assay results from MGA’s diamond drilling at Blue Moon supports the hypothesis that the prospect is a disseminated gold occurrence comparable to some of the mineralisation exploited at the Fosterville mine approximately 50km away. Given the deep weathering and the potential for gold depletion in the oxidised sulphides, it was considered possible that higher grades would be encountered at depth in the fresh (un-weathered) rock. Obtaining samples from fresh rock was a key objective of the drilling completed at Blue Moon in February 2019. The twelve reverse circulation (RC) holes (BBM004-15) completed at Blue Moon by MGA aimed to intercept the sandstone on 50 metre spacing across three sections and to gain samples from beneath the oxide zone. Assay results have been announced for holes BBM007, BBM006 and BBM004, and have shown both high grade intervals and significant widths of anomalous gold grades. As well as 2 metres at 17.87 g/t gold from 57 metres down hole in BBM007, within a zone of 15 metres at 3.81 g/t gold from 51 metres, an intersection of 3 metres at 3.88 g/t gold from 170 metres down hole within a zone of 11 metres at 2.42 g/t gold from 169 metres in hole BBM006 has been announced. Intersections given in this paragraph are apparent width. These results indicate that a high grade zone exists within the target sandstone host. Further drill results and interpretation will be required to understand any concentration of mineralisation within shoots. The base of the oxide zone was at 64 metres in BBM007 within the host sandstone. Visible gold was seen in three samples (3 metres at 13.4 g/t gold from 57-60 metres) and it is possible these are elevated gold values as a result of supergene enrichment close to the base of the oxide zone. BBM004 & 6 intercepted the host sandstone beneath the oxide zone. Logging recorded estimates of up to 4% pyrite and 2% arsenopyrite with minor quartz. No visible gold was seen in these samples. In addition to Blue Moon, two further prospects with similar characteristics at surface, namely anomalous arsenic and broad areas of quartz float, have been identified within an approximately 3km radius. MGA will be further assessing these prospects, referred to as Red Moon and Yellow Moon, in the months to come. Black Cat is among the high priority targets identified by the geophysical interpretation and targeting study completed for MGA by Terra Resources in late 2017 and has not been previously drilled. The prospect is immediately south of ground recently applied for by Newmont Exploration and contains 220 metres of historical workings along three known lines of quartz reef. Strong gold-in-soil anomalism in some areas indicates unworked reefs may remain to be discovered, and rock chip sampling of quartz-poor material indicates potential for disseminated gold. Rock chip samples at Black Cat have returned encouraging grades up to 11.3 g/t gold. Rotary air blast (RAB) drilling is a low cost method well suited to the first pass testing required at Black Cat, and a 450 metre RAB programme commenced in February 2019. Away from Black Cat and the ‘Moon’ prospects, exploration work at Bailieston included 151 surface rock chip samples to help assess targets in the Byron and Cherry Tree areas, which contain numerous northwest trending quartz reefs, including the Byron, Scoulars and Maori reefs that were drilled by MGA in 2017. Of these samples, 51 returned gold grades in excess of 0.5 g/t, with the highest being 67.4 g/t. Of the high grade samples, 26 were re-assayed in accordance with common QA/QC practice, and the repeat assays demonstrated good consistency with the first round of assays. The Creswick project targets gold mineralisation hosted within the Dimocks Main Shale (DMS), which extends over a 15km trend from the mining centre of Ballarat to the south, approximately 7km of which is covered by EL006184 and MGA’s two exploration licence applications. In the project area, the DMS is an approximately 25 metre wide shale containing bedding and cleavage-parallel auriferous quartz veins. Only two holes have previously been drilled to test the DMS within EL006184, both in the 1990s. The results of this drilling included an intercept of 2 metres at 12.28 g/t gold. 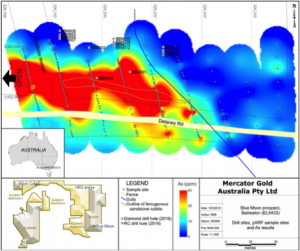 The best previous drill intercept into the DMS elsewhere is 2 metres at 176 g/t gold. MGA drill-tested two gold prospects in the Avoca project area in April and May 2018, also following Dr Boucher’s data review, mapping and geochemical surveying. 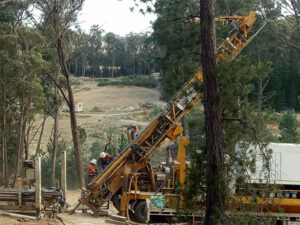 Five holes were completed at the Bung Bong prospect using a diamond core rig. Thereafter, the rig moved to the Monte Christo prospect, where two holes were drilled. Assay results were announced in early June 2018. 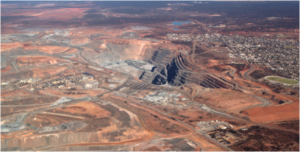 In December 2018, MGA submitted nine contiguous exploration licence applications covering a 1,600 square kilometre package of ground prospective for gold mineralisation in the Yilgarn region of Western Australia, east of the town of Wiluna. The application package is to be known as the Windidda gold project. Archaean greenstones host many of Western Australia and the world’s most prolific gold deposits, and the Windidda applications cover a significant proportion of an identified gravity-magnetic trend with known gold prospects along trend in outcropping greenstone to the south (outside the application areas). The under-cover greenstone gold exploration model has been successfully tested by Greatland Gold (LON:GGP) at its Ernest Giles project located approximately 125km east of the Windidda project. Previous exploration within the Windidda project area has targeted base metal and manganese deposits within the cover sequences. Gravity and magnetic anomalies interpreted to be hosted in greenstone units beneath the cover have not been targeted. These targets are expected to be amenable to aircore drilling to enable rapid assessment of potential for gold mineralisation, after the exploration licences are granted. The Company secured an option over the Iceberg project in Western Australia in August 2018, but after completing its due diligence, elected not to proceed with the acquisition. For the year to 30 September 2018 the Group recorded a total comprehensive expense of £721,460, compared with £562,649 for the year to 30 September 2018. The largest contributor to the total comprehensive expense was the line item “other administrative expenses”, which represents the costs of operating the Group and carrying out exploration at its projects, where these costs are ineligible for capitalisation under applicable accounting standards. The Group’s net assets at 30 September 2018 were £3,651,545, in comparison with £3,735,225 at 30 September 2017. The decrease is due to increased exploration assets as a result of the capitalisation of exploration expenditure during the year being offset by a reduction in cash and cash equivalents. We have audited the financial statements of ECR Minerals Plc (the ‘parent company’) and its subsidiaries (the ‘group’) for the year ended 30 September 2018 which comprise the Consolidated Income Statement, the Consolidated Statement of Comprehensive Income, the Consolidated and Parent Company Statement of Financial Position, the Consolidated and Parent Company Statements of Changes in Equity, the Consolidated and Parent Company Statements of Cash Flows and notes to the financial statements, including a summary of significant accounting policies. The financial reporting framework that has been applied in their preparation is applicable law and International Financial Reporting Standards (IFRSs) as adopted by the European Union and as regards the parent company financial statements, as applied in accordance with the provisions of the Companies Act 2006. We conducted our audit in accordance with International Standards on Auditing (UK) (ISAs (UK)) and applicable law. Our responsibilities under those standards are further described in the Auditor’s responsibilities for the audit of the financial statements section of our report. We are independent of the group and parent company in accordance with the ethical requirements that are relevant to our audit of the financial statements in the UK, including the FRC’s Ethical Standard as applied to listed entities, and we have fulfilled our other ethical responsibilities in accordance with these requirements. We believe that the audit evidence we have obtained is sufficient and appropriate to provide a basis for our opinion. The scope of our audit was influenced by our application of materiality. The quantitative and qualitative thresholds for materiality determine the scope of our audit and the nature, timing and extent of our audit procedures. Group materiality was £60,000 based upon gross assets and the loss before tax. The Parent Company materiality was £55,000 based upon gross assets and the result for the year. For each component in the scope of our group audit, we allocated a materiality that is either equal to or less than our overall group materiality. As part of designing our audit, we determined materiality and assessed the risk of material misstatement in the financial statements. In particular, we looked at areas involving significant accounting estimates and judgement by the Directors and considered future events that are inherently uncertain. As in all of our audits, we also addressed the risk of management override of internal controls, including among other matters consideration of whether there was evidence of bias that represented a risk of material misstatement due to fraud. The Australian and Argentinian subsidiary undertakings represent the principal business units within the Group, upon which we performed audit procedures directly on significant accounts based on size or risk profile to the Group. A full scope audit was undertaken on the financial statements of the Parent Company. Key audit matters are those matters that, in our professional judgment, were of most significance in our audit of the financial statements of the current period and include the most significant assessed risks of material misstatement (whether or not due to fraud) we identified, including those which had the greatest effect on: the overall audit strategy, the allocation of resources in the audit; and directing the efforts of the engagement team. This matter was addressed in the context of our audit of the financial statements as a whole, and in forming our opinion thereon, and we do not provide a separate opinion on this matter. capitalised during the year is not in accordance with IFRS 6. Exploration and development work undertaken to date has indicated the existence of commercially viable quantities of mineral resource. We undertook substantive testing on capitalised expenditure during the year to ensure it satisfied the criteria under IFRS 6. We discussed with management the scope of their future budgeted and planned expenditure on each licence area. for the Philippine authority to formally grant its renewal application. This indicates the existence of a material uncertainty over the recoverability of the carrying value of the Danglay gold project, which amounted to £1,176,729 as at 30 September 2018. The other information comprises the information included in the annual report, other than the financial statements and our auditor’s report thereon. The directors are responsible for the other information. Our opinion on the group and parent company financial statements does not cover the other information and, except to the extent otherwise explicitly stated in our report, we do not express any form of assurance conclusion thereon. In connection with our audit of the financial statements, our responsibility is to read the other information and, in doing so, consider whether the other information is materially inconsistent with the financial statements or our knowledge obtained in the audit or otherwise appears to be materially misstated. If we identify such material inconsistencies or apparent material misstatements, we are required to determine whether there is a material misstatement in the financial statements or a material misstatement of the other information. If, based on the work we have performed, we conclude that there is a material misstatement of this other information, we are required to report that fact. In the light of the knowledge and understanding of the group and the parent company and their environment obtained in the course of the audit, we have not identified material misstatements in the strategic report or the directors’ report. As explained more fully in the directors’ responsibilities statement, the directors are responsible for the preparation of the group and parent company financial statements and for being satisfied that they give a true and fair view, and for such internal control as the directors determine is necessary to enable the preparation of financial statements that are free from material misstatement, whether due to fraud or error. In preparing the group and parent company financial statements, the directors are responsible for assessing the group’s and the parent company’s ability to continue as a going concern, disclosing, as applicable, matters related to going concern and using the going concern basis of accounting unless the directors either intend to liquidate the group or the parent company or to cease operations, or have no realistic alternative but to do so. Our objectives are to obtain reasonable assurance about whether the financial statements as a whole are free from material misstatement, whether due to fraud or error, and to issue an auditor’s report that includes our opinion. Reasonable assurance is a high level of assurance, but is not a guarantee that an audit conducted in accordance with ISAs (UK) will always detect a material misstatement when it exists. Misstatements can arise from fraud or error and are considered material if, individually or in the aggregate, they could reasonably be expected to influence the economic decisions of users taken on the basis of these financial statements. A further description of our responsibilities for the audit of the financial statements is located on the Financial Reporting Council’s website at: http://www.frc.org.uk/auditorsresponsibilities. This description forms part of our auditor’s report. This report is made solely to the company’s members, as a body, in accordance with Chapter 3 of Part 16 of the Companies Act 2006. Our audit work has been undertaken so that we might state to the company’s members those matters we are required to state to them in an auditor’s report and for no other purpose. To the fullest extent permitted by law, we do not accept or assume responsibility to anyone, other than the company and the company’s members as a body, for our audit work, for this report, or for the opinions we have formed. The Company has elected to take the exemption under section 408 of the Companies Act 2006 from presenting the parent company profit and loss account. The loss for the parent company for the year was £373,149 (2017: £208,774 loss). The notes on pages 26 to 41 are an integral part of these financial statements. 1. Settlement of creditors of £15,000 (2017: £80,994) with ordinary shares. The Company and the Group operated mineral exploration and development projects. The Group’s principal interests are located in Argentina, the Philippines and Australia. The Company is a public limited company incorporated and domiciled in England. The registered office of the Company and its principal place of business is Unit 117, Chester House, 81-83 Fulham High Street, Fulham Green, London SW6 3JA. 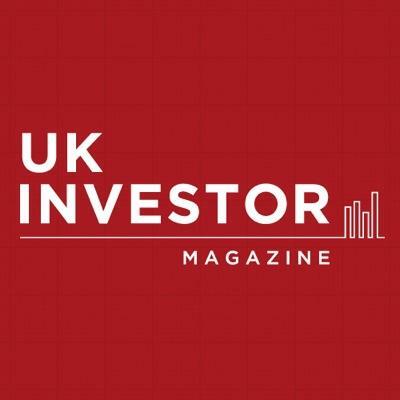 The Company is listed on the Alternative Investment Market (AIM) of the London Stock Exchange. The principal accounting policies that have been used in the preparation of these consolidated financial statements are set out below. The policies have been consistently applied unless otherwise stated. The financial statements of both the Group and the Parent Company have been prepared in accordance with International Financial Reporting Standards (IFRSs) and Interpretations issued by the IFRS Interpretations Committee (IFRIC) as adopted by the European Union and with those parts of the Companies Act 2006 applicable to companies reporting under IFRS. These are the standards, subsequent amendments and related interpretations issued and adopted by the International Accounting Standard Board (IASB) that have been endorsed by the European Union at the year end. The consolidated financial statements have been prepared under the historical cost convention, as modified by the revaluation of certain financial instruments. The Directors have taken advantage of the exemption available under Section 408 of the Companies Act 2006 and have not prepared an Income Statement or a Statement of Comprehensive Income for the Company alone. The Group and Parent Company financial statements have been prepared on a going concern basis as explained in the Directors’ Report. The adoption of these standards and amendments did not have any impact on the financial position or performance of the Group. The Group intends to adopt these standards when they become effective. The introduction of these new standards and amendments is not expected to have a material impact on the Group or Parent Company. The consolidated financial statements incorporate the financial statements of the Company and two of its subsidiaries made up to 30 September 2018. Subsidiary undertakings acquired during the period are recorded under the acquisition method of accounting and their results consolidated from the date of acquisition, being the date on which the Company obtains control, and continue to be consolidated until the date such control ceases. The Group controls an entity when the Group is exposed to, or has rights to, variable returns from its involvement with the entity and has the ability to affect those returns through its power over the entity. It is the prime responsibility of the Board to ensure the Group and Company remains a going concern. At 30 September 2018, the Group had cash and cash equivalents of £781,142 and no borrowings. The Group’s financial projections and cash flow forecasts covering a period of at least twelve months from the date of approval of these financial statements show that the Group will have sufficient available funds in order to meet its contracted and committed expenditure. Further details are included in Note 19 to the financial statements. The Directors are confident in the ability of the Group to raise additional funding, if required, from the issue of equity and/or the sale of assets. Based on their assessment of the financial position, the Directors have a reasonable expectation that the Group and Company will be able to continue in operational existence for the next 12 months and continue to adopt the going concern basis of accounting in preparing these Financial Statements. Cash includes petty cash and cash held in current bank accounts. Cash equivalents include short–term investments that are readily convertible to known amounts of cash and which are subject to insignificant risk of changes in value. Property, plant and equipment are stated at cost, less accumulated depreciation and any provision for impairment losses. Expenses incurred in respect of the maintenance and repair of property, plant and equipment are charged against income when incurred. Refurbishments and improvements expenditure, where the benefit is expected to be long lasting, is capitalised as part of the appropriate asset. An item of property, plant and equipment ceases to be recognised upon disposal or when no future economic benefits are expected from its use or disposal. Any gain or loss arising on cessation of recognition of the asset (calculated as the difference between the net disposal proceeds and the carrying amount of the asset) is included in the income statement in the year the asset ceases to be recognised. All costs associated with mineral exploration and investments are capitalised on a project–by–project basis, pending determination of the feasibility of the project. Costs incurred include appropriate technical and administrative expenses but not general overheads. If an exploration project is successful, the related expenditures will be transferred to mining assets and amortised over the estimated life of the commercial ore reserves on a unit of production basis. Where a licence is relinquished or a project abandoned, the related costs are written off in the period in which the event occurs. Where the Group maintains an interest in a project, but the value of the project is considered to be impaired, a provision against the relevant capitalised costs will be raised. The recoverability of all exploration and development costs is dependent upon the discovery of economically recoverable reserves, the ability of the Group to obtain necessary financing to complete the development of reserves and future profitable production or proceeds from the disposition thereof. Individual assets are tested for impairment whenever events or changes in circumstances indicate that the carrying amount of an asset may exceed its recoverable amount, being the higher of net realisable value and value in use. Any such excess of carrying value over recoverable amount or value in use is taken as a debit to the income statement. Intangible exploration assets are not subject to amortisation and are tested annually for impairment. A provision is recognised in the Statement of Financial Position when the Group or Company has a present legal or constructive obligation as a result of a past event, and it is probable that an outflow of economic benefits will be required to settle the obligation. If the effect is material, provisions are determined by discounting the expected future cash flows at a pre–tax rate that reflects current market assessments of the time value of money and, where appropriate, the risks specific to the liability. In accordance with IAS 17, leases in terms of which the Group or Company assumes substantially all the risks and rewards of ownership are classified as finance leases. All other leases are regarded as operating leases and the payments made under them are charged to the income statement on a straight line basis over the lease term. There is no current tax payable in view of the losses to date. Deferred income taxes are calculated using the Statement of Financial Position liability method on temporary differences. Deferred tax is generally provided on the difference between the carrying amounts of assets and liabilities and their tax bases. However, deferred tax is not provided on the initial recognition of goodwill or on the initial recognition of an asset or liability unless the related transaction is a business combination or affects tax or accounting profit. Deferred tax on temporary differences associated with shares in subsidiaries and joint ventures is not provided if reversal of these temporary differences can be controlled by the Company and it is probable that reversal will not occur in the foreseeable future. In addition, tax losses available to be carried forward as well as other income tax credits to the Company are assessed for recognition as deferred tax assets. Deferred tax liabilities are provided in full, with no discounting. Deferred tax assets are recognised to the extent that it is probable that the underlying deductible temporary differences will be able to be offset against future taxable income. Current and deferred tax assets and liabilities are calculated at tax rates that are expected to apply to their respective period of realisation, provided they are enacted or substantively enacted at the Statement of Financial Position date. Changes in deferred tax assets or liabilities are recognised as a component of tax expense in the income statement, except where they relate to items that are charged or credited directly to equity, in which case the related current or deferred tax is also charged or credited directly to equity. Subsidiaries are entities controlled by the Group. The Group controls an entity when it is exposed to, or has rights to, variable returns from its involvement with the entity and has the ability to affect those returns through its power over the entity. The investments in subsidiaries held by the Company are valued at cost less any provision for impairment that is considered to have occurred, the resultant loss being recognised in the income statement. “Share capital” represents the nominal value of equity shares, both ordinary and deferred. “Share premium” represents the excess over nominal value of the fair value of consideration received for equity shares, net of expenses of the share issues. “Other reserves” represent the fair values of share options and warrants issued. “Retained reserves” include all current and prior year results, including fair value adjustments on available for sale financial assets, as disclosed in the consolidated statement of comprehensive income. “Exchange reserve” includes the amounts described in more detail in the following note on foreign currency below. The consolidated financial statements are presented in pounds sterling which is the functional and presentational currency representing the primary economic environment of the Group. Foreign currency transactions are translated into the respective functional currencies of the Company and its subsidiaries using the exchange rates prevailing at the date of the transaction or at an average rate where it is not practicable to translate individual transactions. Foreign exchange gains and losses are recognised in the income statement. Monetary assets and liabilities denominated in a foreign currency are translated at the rates ruling at the Statement of Financial Position date. The assets and liabilities of the Group’s foreign operations are translated at exchange rates ruling at the Statement of Financial Position date. Income and expense items are translated at the average rates for the period. Exchange differences are classified as equity and transferred to the Group’s exchange reserve. Such differences are recognised in the income statement in the periods in which the operation is disposed of. The Company operates equity–settled share–based remuneration plans for the remuneration of some of its employees. The Company awards share options to certain Company Directors and employees to acquire shares of the Company. Additionally, the Company has issued warrants to providers of loan finance. All goods and services received in exchange for the grant of any share–based payment are measured at their fair values. Where employees are rewarded using share–based payments, the fair values of employees’ services are determined indirectly by reference to the fair value of the instrument granted to the employee. The fair value is appraised at the grant date and excludes the impact of non–market vesting conditions. Fair value is measured by use of the Black Scholes model. The expected life used in the model has been adjusted, based on management’s best estimate, for the effects of non–transferability, exercise restrictions, and behavioural considerations. All equity–settled share–based payments are ultimately recognised as an expense in the income statement with a corresponding credit to “other reserves”. If vesting periods or other non–market vesting conditions apply, the expense is allocated over the vesting period, based on the best available estimate of the number of share options expected to vest. Estimates are subsequently revised if there is any indication that the number of share options expected to vest differs from previous estimates. Any cumulative adjustment prior to vesting is recognised in the current period. No adjustment is made to any expense recognised in prior years if share options ultimately exercised are different to that estimated on vesting. Upon exercise of share options the proceeds received net of attributable transaction costs are credited to share capital and, where appropriate, share premium. A gain or loss is recognised in profit or loss when a financial liability is settled through the issuance of the Company’s own equity instruments. The amount of the gain or loss is calculated as the difference between the carrying value of the financial liability extinguished and the fair value of the equity instrument issued. The Group’s financial assets comprise cash and cash equivalents, investments and loans and receivables. Financial assets are assigned to the respective categories on initial recognition, depending on the purpose for which they were acquired. This designation is re–evaluated at every reporting date at which a choice of classification or accounting treatment is available. The Group’s loans, investments and receivables are non–derivative financial assets with fixed or determinable payments that are not quoted in an active market. Loans and receivables are measured at fair value on initial recognition. After initial recognition they are measured at amortised cost using the effective interest rate method, less any provision for impairment. Any change in their value is recognised in profit or loss. The Group’s receivables fall into this category of financial instruments. Discounting is omitted where the effect of discounting is immaterial. All receivables are considered for impairment on a case–by–case basis when they are past due at the Statement of Financial Position date or when objective evidence is received that a specific counterparty will default. Investments that are held as available for sale financial assets are financial assets that are not classified in any other categories. After initial recognition, available for sale financial assets are measured at fair value. Any gains or losses from changes in the fair value of the financial asset are recognised in equity, except that impairment losses, foreign exchange gains and losses on monetary items and interest calculated using the effective interest method are recognised in the income statement. Where there is a significant or prolonged decline in the fair value of an available for sale financial asset (which constitutes objective evidence of impairment), the full amount of the impairment, including any amount previously charged to equity, is recognised in the consolidated income statement. The Directors consider a significant decline to be one in which the fair value is below the weighted average cost by more than 25%. A prolonged decline is considered to be one in which the fair value is below the weighted average cost for a period of more than twelve months. If an available for sale equity security is impaired, any further declines in the fair value at subsequent reporting dates are recognised as impairments. Reversals of impairments of available for sale equity securities are not recorded through the income statement. Upon sale, accumulated gains or losses are recycled through the income statement. Financial liabilities, which are measured at amortised cost, and equity instruments are classified according to the substance of the contractual arrangements entered into. An equity instrument is any contract that evidences a residual interest in the assets of the entity after deducting all of its financial liabilities. Any instrument that includes a repayment obligation is classified as a liability. Where the contractual liabilities of financial instruments (including share capital) are equivalent to a similar debt instrument, those financial instruments are classed as financial liabilities, and are presented as such in the Statement of Financial Position. Finance costs and gains or losses relating to financial liabilities are included in the income statement. Finance costs are calculated so as to produce a constant rate of return on the outstanding liability. such capital is classed as an equity instrument. Dividends and distributions relating to equity instruments are debited direct to equity. The estimates and underlying assumptions are reviewed on an on–going basis. Revisions to accounting estimates are recognised in the year in which the estimate is revised if the revision affects only that year or in the year of the revision and future years if the revision affects both current and future years. share–based payments (Note 6 and Note 13). Basic earnings per share has been calculated by dividing the loss attributable to equity holders of the company after taxation by the weighted average number of shares in issue during the year. There is no difference between the basic and diluted earnings per share as the effect on the exercise of options and warrants would be to decrease the earnings per share. Details of share options and warrants that could potentially dilute earnings per share in future periods is set out in Note 13. PLEASE NOTE THAT THIS DOCUMENT IS IMPORTANT AND REQUIRES YOUR IMMEDIATE ATTENTION. If you are in any doubt as to what action you should take, please consult your stockbroker or other independent adviser authorised under the Financial Services and Markets Act 2000 immediately. If you have recently sold or transferred all of your ordinary shares in ECR Minerals PLC, please forward this document, together with the accompanying documents, as soon as possible either to the purchaser or transferee or to the person who arranged the sale or transfer so they can pass these documents to the person who now holds the shares. If you have sold or transferred only part of your holding of ordinary shares in ECR Minerals PLC, you are advised to consult your stockbroker, bank or other agent through whom the sale or transfer was effected. 1 To receive, consider and adopt the annual accounts of the Company for the year ended 30 September 2018, together with the reports of the directors and auditors thereon. 2 That Samuel James Melville Garrett, a director retiring in accordance with article 79.1.1 of the Company’s articles of association, be elected as a director of the Company. 3 To re-appoint PKF Littlejohn LLP as auditors of the Company, to hold office until the conclusion of the next general meeting at which accounts are laid before the Company. 4 To authorise the audit committee to determine the remuneration of the auditors of the Company. 5 That the directors be generally and unconditionally authorised pursuant to and in accordance with section 551 of the Companies Act 2006 (the “CA 2006”) to exercise all the powers of the Company to allot shares or grant rights to subscribe for, or to convert any security into, shares in the Company up to an aggregate nominal amount of £10,000 provided that this authority shall, unless renewed, varied or revoked by the Company, expire on 30 June 2020 or, if earlier, the date of the next annual general meeting of the Company, save that the Company may, before such expiry, make offers or agreements which would or might require equity securities to be allotted (or treasury shares to be sold) after the authority expires and the directors may allot equity securities (or sell treasury shares) in pursuance of any such offer or agreement as if the authority had not expired. securities of up to an aggregate nominal value of £10,000. The authority granted by this resolution will expire at the conclusion of the Company’s next annual general meeting after this resolution is passed or, if earlier, at the close of business on 30 June 2020 save that the Company may, before such expiry, make offers or agreements which would or might require equity securities to be allotted (or treasury shares to be sold) after the authority expires and the directors may allot equity securities (or sell treasury shares) in pursuance of any such offer or agreement as if the authority had not expired. (ii) the amount stipulated by the regulatory technical standards adopted by the European Commission pursuant to Article 5(6) of the Market Abuse Regulation (EU) No. 596/2014. This authority shall continue until the conclusion of the Company’s annual general meeting in 2020 or 30 June 2020, whichever is the earlier, provided that if the Company has agreed before this date to purchase ordinary shares where these purchases will or may be executed after the authority terminates (either wholly or in part) the Company may complete such purchases. The following paragraphs explain, in summary, the resolutions to be proposed at the annual general meeting (the “Meeting”). Resolution 1 proposes that the Company’s annual accounts for the period ended 30 September 2018, together with the reports of the directors and auditors on these accounts, be received, considered and adopted. Resolution 2 proposes that Mr Garrett, who was appointed since the last Annual General Meeting of the Company and is retiring in accordance with article 79.1.1 of the Company’s articles of association, be elected as a director of the Company. Resolution 3 proposes the reappointment of the Company’s existing auditor to hold office until the end of the next annual general meeting. Resolution 4 is to authorise the audit committee of the Company to determine the remuneration of the Company’s auditors. Resolution 5 is to renew the directors’ power to allot shares in accordance with section 551 of the CA 2006. The authority granted at the annual general meeting on 24 April 2018 is due to expire on 23 April 2019 (i.e. the proposed date of the forthcoming annual general meeting). If passed, the resolution will authorise the directors to allot equity securities up to a maximum nominal amount of £10,000, which represents approximately 224% of the Company’s issued ordinary shares as at 28 March 2019 (being the latest practicable date before publication of this document). If given, these authorities will expire at the annual general meeting in 2020 or on 30 June 2020, whichever is the earlier. The directors have no present intention to issue new ordinary shares, other than pursuant to the exercise of options or warrants. However, the directors consider it prudent to maintain the flexibility to take advantage of business opportunities that this authority provides. As at the date of this document the Company does not hold any ordinary shares in the capital of the Company in treasury. Resolution 6 is to grant the directors the authority to allot equity securities for cash or sell any shares held in treasury otherwise than to existing shareholders pro rata to their holdings, as there may be occasions where it is in the best interests of the Company not to be required to first offer such shares to existing shareholders. Accordingly, resolution 6 will be proposed as a special resolution to grant such a power and will permit the directors, pursuant to the authority granted by resolution 5, to allot equity securities (as defined by section 560 of the CA 2006) or sell treasury shares for cash without first offering them to existing shareholders in proportion to their existing holdings up to a maximum nominal value of £10,000 representing approximately 224% of the Company’s issued ordinary shares as at 28 March 2019 (being the latest practicable date before publication of this document). If given, this authority will expire at the annual general meeting in 2020 or on 30 June 2020, whichever is the earlier. Resolution 7 will be proposed as a special resolution and will give the Company authority to purchase its own shares in the markets up to a limit of 10 per cent. of its issued ordinary share capital. The maximum and minimum prices are stated in the resolution. Your directors believe that it is advantageous for the Company to have this flexibility to make market purchases of its own shares. Your directors will exercise this authority only if they are satisfied that a purchase would result in an increase in expected earnings per share and would be in the interests of shareholders generally. In the event that shares are purchased, they would either be cancelled (and the number of shares in issue would be reduced accordingly) or, in accordance with the CA 2006, be retained as treasury shares. If given, this authority will expire at the annual general meeting in 2020 or on 30 June 2020, whichever is the earlier. As at 28 March 2019, the total number of outstanding options and warrants over ordinary shares in the Company was 309,179,606, which represents approximately 69 per cent. of the Company’s voting rights at that date. If the Company were to purchase its own ordinary shares to the fullest possible extent of its authority from shareholders (existing and being sought), this number of outstanding options and warrants could potentially represent 82 per cent. of the voting rights of the Company as at 28 March 2019. 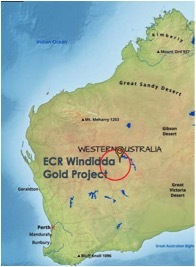 ECR Minerals plc (LON:ECR), the precious metals exploration and development company, is pleased to announce it has today released a new presentation covering the Windidda gold project in Western Australia, details of which were released in the Company’s announcement of 3 January 2019 entitled “Strategic Gold Licence Applications – Yilgarn Region Australia”. Further updates will be made in due course regarding the progress of licence applications, continuing project review and exploration planning. 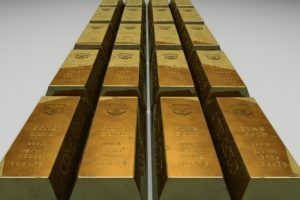 Craig Brown, Chief Executive Officer of ECR Minerals plc, commented: “ECR Minerals is building its strategic gold exploration portfolio at what the directors believe is a fascinating time in the gold industry, underlined by the acquisition of Goldcorp Inc. by Newmont Mining Corp. announced this week. Larger companies within the sector are often in search of new gold discoveries to replace reserves as they are mined, potentially putting proactive junior gold explorers in a prime position should they be able to identify highly prospective territory, achieve a discovery and/or build strategic knowledge through exploration. ECR is a mineral exploration and development company. ECR’s wholly owned Australian subsidiary Mercator Gold Australia has 100% ownership of the Avoca, Bailieston, Creswick, Moormbool and Timor gold exploration licences in central Victoria, Australia and the Windidda gold project in the Yilgarn region, Western Australia.